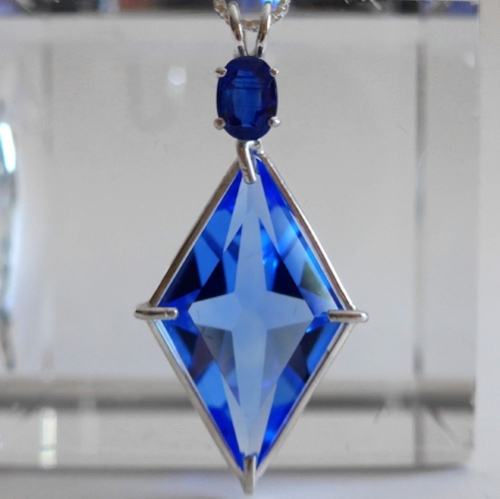 Dimensions (HxWxD): 1.625" x 0.75" x 0.35"
This stunning Siberian Blue Ascension Star Pendant is crowned with a beautiful Kyanite Oval Gemstone and set into Sterling Silver so that the stone can breathe. It comes with a sterling silver chain which sits at the thymus, between the throat and heart chakras where it will be of the utmost benefit. It comes in a velveteen jewelry box for safekeeping. This lab quartz is grown in Russia and according to the jeweler who created it, it enhances psychic insight and development. This pendant will be a great tool for meditation and any subtle energy work. This piece can also be used for psychic protection as well as assisting us in speaking our Truth connected to our Divine Purpose. Blue-green kyanite has great chatoyancy which is the bright reflective opalescent light seen on various gemstones. It can even be seen both in the polished and the unpolished state. Kyanite is said to aid in balancing yin and yang energies, as an aid to meditation and as a way to unify all the chakras. As with all blue stones, it also assists the throat chakra and is a valuable aid in communication, both with others and with the higher mind, guides and angelic beings. Also as in other blue stones, kyanite is a tremendous assistant in bringing our minds to a place of peace and quietude. It has certainly been a stone to quiet my mind, assist in meditation, help me to focus and ground energies, especially when feeling torn in several directions at once. 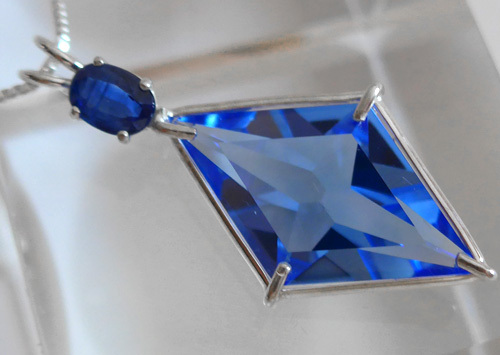 Kyanite has the distinct advantage of being one of those stones which, metaphysically, is said to remain clear and not require clearing (as are such other stones such as super 7 and citrine). It is believed that these stones do not accumulate or retain negative energy. However, we always clear and clean our crystals and Reiki attune them, because in our experience, it is always wise to keep all of your magical tools as clear as possible! Kyanite has a vitreous pearly luster, which is what makes it so appealing and soothing. It can range from translucent to transparent and grows in fibers, which is why it is often seen in long columnar forms. Above weight is shipping weight. Actual weight is 7 grams or .25 ounce.